Air Canada has confirmed it will hire as many as 150 new cabin crew as it continues to prepare for the launch of new leisure carrier Air Canada rouge. The carrier is expected to take off in July this year as the Canadian flag-carrier seeks to compete in the growing leisure travel sector. “With the introduction of Air Canada rouge, Air Canada enters the growing leisure travel market on a truly competitive basis,” explained Air Canada chief commercial officers Ben Smith. 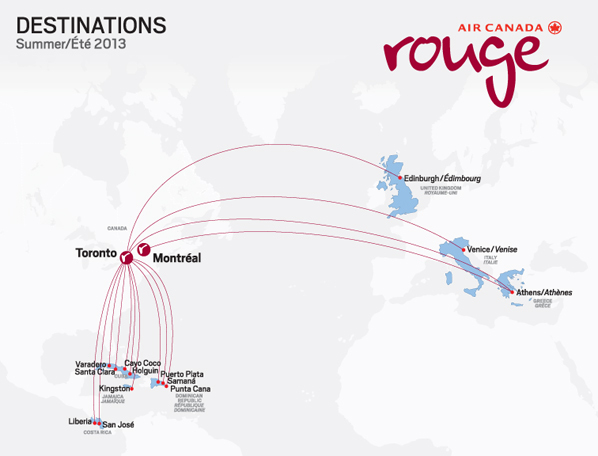 For its inaugural 2013 season, Air Canada rouge will introduce new routes not currently operated by Air Canada to Venice, Italy and Edinburgh, Scotland. In addition, Air Canada seasonal services from Toronto and Montreal to Athens, Greece will be flown by the leisure carrier. Similarly, existing Air Canada flights operated in cooperation with Air Canada Vacations to Cuba, the Dominican Republic, Jamaica and Costa Rica will be operated by Air Canada rouge effective July 2013. The Air Canada rouge fleet will initially be comprised of two Boeing 767-300ER aircraft to operate transatlantic flights in a two-cabin configuration and two Airbus A319 aircraft to operate North American flights in an all-economy configuration. These four aircraft will be released from Air Canada’s existing fleet to Air Canada rouge as the mainline carrier takes delivery of two new Boeing 777-300ER aircraft in 2013. Air Canada rouge will expand to other popular holiday destinations as Air Canada starts to take delivery of new Boeing 787 Dreamliner aircraft in 2014, thereby freeing up aircraft for deployment in the Air Canada rouge fleet. As this occurs, and subject to commercial demand, Air Canada rouge may operate up to 20 Boeing 767-300ER aircraft and 30 Airbus A319 aircraft, for a total of 50 aircraft, to pursue opportunities in markets made viable by Air Canada rouge’s lower operating cost structure. The new jobs will be created for flight attendants and pilots at Air Canada rouge, in addition to Air Canada hiring 900 employees to meet its own planned workforce requirements as part of its 2012-2013 recruitment program announced September 20th, 2012.